It's still a while to wait until Oculus Rift is available in full its consumer version and, in the mean time, $350 is a lot to spend on something that's not even market ready. Thankfully, there are plenty of options for getting yourself a VR headset at a fraction of the cost if you're willing to do a little DIY. Glue gun at the ready and the patience to wait until your eBay orders arrive? Good. Well, fill in the time with a little knowhow and some pointers in the right direction to making yourself a home-made virtual reality experience. Whether it's Google's, Dodocase's or whosever you like, the cardboard VR headset is the most basic and definitely the simplest of all to put together. Go with the former company's official package and you'll still have to source yourself some magnifying lenses, magnets, rubber bands and velcro. Dodocase, on the other hand, will have everything in the box ready for you including the pre-cut cardboard - really rather good for $29.95. Personally, though, we'd recommend the both highly amusing and very handy DIY VR hat-mount to go with it. The cardboard designs are okay but they're not the most comfortable nor easy to wear that you'll find. For roughly the same amount of money - but requiring considerable more skill - you can create the basic superstructure of your VR headset yourself. The basic elements are the eye lenses, the box and the display and there are plenty of places to score the materials you might need. Of the three, the lenses are the place to take you time and spend the money. The quality of your vision is the soul of the VR experience and it will bug the hell out of you if you get lenses that aren't as clear or as accurate as they could be. You can pinch them from a pair of old binoculars if you want but better would be to source a set of 5x magnification aspheric lenses which work just fine if you're using a 5-6-inch display size. For something a little premium, though, you may want to think about the $99 Wearality lenses, which are designed specifically for VR and also come mounted on a set of frames and a place to slot a smartphone which saves you having to jam them into some old, ill-fitting spectacles or ski goggles measure out focal lengths. A smartphone is the obvious display to use but they can be a little heavy and won't necessarily offer the best experience depending upon resolution, field of view and refresh rate of the panel. Do also beware of going for larger screen sizes. They might have better display tech but, if they're tablets or big mobiles, then there's the extra weight on your face to consider. One option is to go and harvest a screen from an old high-end netbook or other such device. It's a more complicated build but it will give something that's both a little larger, at 8 or 9 inches, and also at a decent spec too. The Sony Vaio P is one recommended choice. You don't have to use cardboard for the main structure of your VR headset. In fact, there are nicer, better looking and more face-friendly materials with which you can build your box. Black foam board is a popular option for its comfort, its weight and its darkening effect. You can pick sheets of the stuff up from the likes of Hobbycraft or Amazon for around $10 for an A1 sheet. To cut out the right shapes, it's a matter of working out the focal length of your lenses and the width of the glasses frames that you're using to house them in. Then cut one foam board rectangle to the same width as the frames and to the length of the focal distance multiplied by 1.5, and another to the same dimensions but with an added 1cm onto the length. These are the top and bottom faces of the headset respectively. For the side pieces, they need to be cut as long as the length of the top section and as wide as the short side of the phone or screen that you're going to mount in the end. And the end piece itself needs to be a section that's as wide as your glasses and, again, as high as the short dimension of your VDU. Cut that out and then cut the same shape again about 5mm inside to create a frame. In terms of assembly, it's about gluing the lot together with a hot glue gun. You'll need to cut an arc into one of the short ends of both the top and bottom pieces to accommodate your face as well as an extra notch for you nose. Get an elastic strap to keep it all in place on your head and you can use the same material for holding a smartphone in at the other end. Alternatively, you can create a second front end piece out of foam board to form a holder with a top slot where you insert your device. There are plenty of variations on this theme depending upon what lenses and glasses are at the core of your construction. If you're going to use a smartphone for your internal VR screen, then what's described so far is enough for a VR experience if you're content just to play with the Google Cardboard mobile VR apps. To really broaden the menu, though, you need to get your headset working with a PC and then just about all of your favourite titles will become VR-possible whether they were made that way or not. There's some software to hand for that job which will mirror whatever you've got on your laptop or desktop screen onto a mobile phone called Splashtop or Kainy depending upon your needs, and by pulling the content in from computer to your VR headset, that's at least some, if not half, the battle. The complicated part then, is that you'll need to get what you see on your mobile screen to track with your head movements. That's not a problem when all of the content is originating from a smartphone app but as soon as you're mirroring from a PC, then you lose the benefit of those accelerometers and gyros. Fortunately, there are one or two tried and tested methods to get the job done. The most expensive, but probably the best, way to sort out the head tracking problem is by picking up the genuine Oculus head tracking circuitry off the internet for in the region of $49. It's pretty cheap in the grand scheme but not when you consider that you could build an entire headset for less than that same amount. It's also possible to buy an Oculus screen too which will work rather well in combination with the programs in the Oculus SDK running on your PC which is free to download. Your two more home-made solutions to the problem are either attaching a gesture-control air mouse or an LED to your headset. Each can be detected and tracked by your PC with the right software. Freetrack is your best bet for the optical motion tracking software. The other download of note is TriDef 3D. It allows just about any game on the PC to run in stereoscopic mode whether they were intended for 3D play or not. The software creates distinct left and right eye images that make the illusion work. You may also find certain pre-cooked 3D mods out there for your favourite titles. If you're about to embark upon a DIY VR headset project of your own, then we'd strongly advise you take a full look at some of these key home-made VR sites for more information. The VRWiki is an excellent hub of what to do listed by each component of the build. 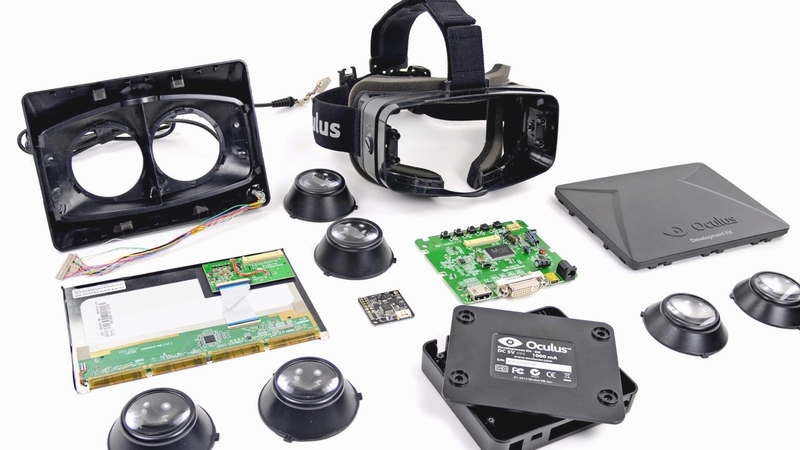 It's also got links to some of the best home-made VR headset projects on the internet which themselves usually include step-by-step instructions on what to buy, what to cut and how to put it all together. The subreddit on DIYRift is also an excellent place to find guides plus it's very handy for talking to the community about the specifics of your project. Lastly, two particular DIY VR headset builds that we think are well worth looking at are the Nova and Ohaple's $20 project. Good luck and see you in the virtual world.